I wanted to write on the topic of guest blogging and its role in link building campaigns since a couple of months but could not manage to due to busy publishing schedule on TechWelkin and my other websites. Nowadays, the topic of guest blogging is being hotly discussed among bloggers and SEO experts. The storm was kicked up by a post from Matt Cutts, Head of Webspam Team at Google, on his blog. Matt mentioned that days of using guest blogging as a technique for link building are gone. This came as a shock, although not entirely out-of-the-blue. Mind you, Matt’s statement is important because he is one of those who control how Google ranks websites and throw search results when queried. Guest blogging refers to the practice of writing posts on the blogs of other people. If you pick up any old book on SEO, you’ll find that guest blogging was a highly recommended method of getting back-links to your website. This was the most relied upon method which SEOs used to embark on link building missions. Guest blogging has been portrayed as a win-win situation for both the writer and the publisher. Publishing blog gets free content and the writer get the opportunity to insert a few links within the post matter. These links could point to writer’s website. As you know, if a website has more back-links, Google used to trust that the website is a good one. In turn, the websites used to get higher ranking in search results. 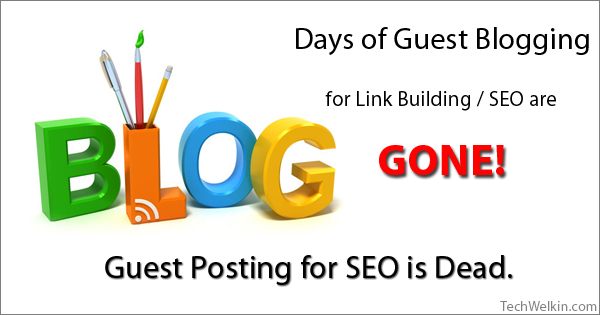 Guest Blogging as a link building method will no longer work. As it happens with several good things, the benevolent idea of guest blogging was exploited excessively by the so-called “SEO experts”. People began to operate guest blogging networks and communities. Writing and providing “quality” guest posts became a business in itself. Link building through submitting the same article to tens of blogs became a common practice. Moreover, exploiters of guest blogging became too greedy and began to insert too many links within an article. Guest posts became heavily pregnant with keywords in order to get more attention/rank from Google. Out of nowhere, the term “Keyword Density” became popular and SEO experts began feeding their clients with advises that inserting a “good” amount of keywords in an article will help their cause. And it indeed did –to some extent. But not for long! Soon, the tide changed and keyword & link stuffing began to be considered as black hat tricks. What does Matt Cutt’s Statement Mean? At first, Cutts had said that the days of guest blogging are gone. But he was quick to clarify that guest blogging as a means of link building will no longer work. Google’s algorithms have become smart enough to see through intentions of a guest blogger. These algorithms now make an assessment whether a post is s genuine guest post or it has been used as a black hat trick for link building. This means that you should no longer rely solely on guest posts to get back-links. The only way to be successful in long-term is to produce good quality content and let your repertoire of back-links grow naturally. So, Now, Would Be No Guest Posts on Internet? It’s not quite like this. Guest posting is a great way of sharing content on relevant websites. If your readers want to write some good posts for your blog –there is no reason why they may be stopped. As long as you do guest posting in natural way, there should not be any problem. Just don’t overdo things! Let me know, readers, if you have any query in this regard. I will be happy to answer your question!